Standing in the courtyard at RR Campus in Kathmandu, Roshan Mahato looks relaxed and proud. This, just 7 years ago was the spot where he was teased and harassed so badly by his peers that he transferred to another college. Today, the president of Nepal’s LGBTI (lesbian, gay, bisexual, transgender, and intersex) Student Forum, Mahato is a familiar face on campuses around the country. The change, he says, took time and patience – with others and with himself. During high school, he moved to Kathmandu and worked at a hotel cleaning toilets. In 2003, he saw photos of Blue Diamond Society’s Gai Jatra LGBTI pride parade on Durbar Marg. “I was afraid, but so curious. I didn’t have a vocabulary for how I felt. I thought maybe this was it – that these people felt the same way.” Months later, he joined a casual discussion group at BDS. This, he says, is where he started surprising himself. During that meeting, the BDS staff member asked if anyone wanted to share a personal experience or story. The room sat silent for several minutes, and then Mahato spoke up. After he moved to Kathmandu, Mahato made plenty of gay male friends. They would meet online and chat on anonymous forums, or in discreet tea shops in the city. But their conversations were almost always punctuated by two points; no one can know about this, and marriage to a woman was certainly in the future. Pant founded Blue Diamond Society in 2001. The organisation now has CBO affiliates in nearly 40 districts and has made contact with over 400,000 people across the country who identify as sexual and gender minorities, or LGBTI. It’s courage like Mahato’s, Pant believes, that has made such growth possible. Mahato’s public coming out as a BDS volunteer and young gay man gave Pant confidence that the younger generation of LGBTI people would be bold and help the rights movement by living their lives openly. Almost immediately, Mahato felt the effects. “I got phone calls and text messages for the next three days,” he recalls. “All of a sudden, I had dozens of new gay friends. They all wanted to meet me and ask me questions. But mostly, they wanted to know how I told my family.” Soon, Mahato was casually counseling gay men in Kathmandu on everything from sexual health to coming out to friends and how to respond when families insist they get married. Along with this private attention, Mahato slowly became a target for media attention and, with that, the leadership of student organisations at Tribhuvan University, where he was enrolled in sociology program. A newspaper article about “the gay student at TU” outed him to his brother, who is a police officer in the Tarai. 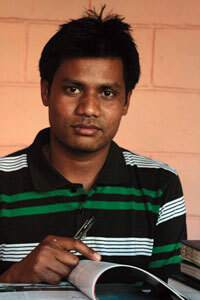 Mahato’s other brother, a school teacher in Chitwan, was just as supportive. Nonetheless, he says he continued to get phone calls from his mother asking him why he wasn’t married yet. Mahato is now a popular public figure in Nepal’s LGBTI rights movement. He’s represented the organization at conferences in New Zealand and the United States, and is the founding president of the Student Forum, which now boasts nearly 200 members. But these successes are balanced with the reality of daily life for gay men in Kathmandu. And people are. “Roshan’s leadership among students made it clear that helping LGBTI students feel welcome and safe needed to be a priority for us,” says Shailendra Sharma Gaudel, president of Nepal Student Union for RR Campus. Three months ago, Gaudel’s student union successfully lobbied the college administration to allow third gender students to use the gender-neutral staff toilet.